I'll admit it. I was a Normite. In fact, it was Norm Abram who taught me how to use power tools. At a time when there seemed to be very few female woodworkers (16 years ago), it was a tad bit intimidating to ask for assistance in a woodworking store full of men. But good 'ol Norm was there to give me my first push down the slippery slope of woodworking. 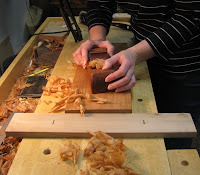 Then about 10 years ago, I became interested in working with handtools. Now I use a blended workshop. But to all of us—power tool, hand tool, or blended woodworkers—don't we all sh are an irrepressible and magnetic attraction to workbenches? My conundrum as a beginner handtool user was: How do you use a workbench? How do you make the most of it? What part of the tail vise is used to clamp stock? The answers were found in books like The Workbench Book, Making Workbenches, and Choosing and Using Handtools (among others). And with the recent release of Chris Schwarz's book, we have another fabulous resource. Books like these disclose the importance of bench jigs. Pictured are a cut off jig for dowels and a planing stop. The cut off jig has a roughly chiseled V-groove that holds a dowel in place, and a piece of wood glued beneath the front edge that acts as a bench hook. The planing jig has through-tenoned dowels that drop down into holes that are bored into my benchtop. Both jigs see a lot of use in the shop. 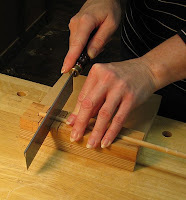 Once I learned how to use a workbench, how to make the most of it, how to build and employ bench jigs, it opened up a whole new dimension in woodworking. And the slippery slope became a whole lot steeper. If you were building a new workbench today, what kind would you build? Would you still build in the tool trough? Vic, I didn't actually build my workbench; it's just a cheapie. But I do intend to build one someday, and no, it will not have a tool trough. The one on my bench only serves to collect sawdust and shavings. Any tool that winds up in there is usually buried and lost until I clean it. Your comment about the tool tray is right on target - I avoided that feature for the same reason. It is good to see your posts again - and GREAT to see you are doing better. Kari - as usual, great photos and clear as a bell descriptions. I'm still waiting to hear when your book on woodworking techniques will be published? One more question... I see two hands in most of the photos. How do you manage to take the picture? I realize you could use a timer, but each image looks so perfectly posed. No hangnails, no funny looking shadows falling across the workpiece and nobody reflected in a shiny surface. Is the dog trained to hit the shutter release on command? Thanks for the ideas, Rob, and for the reminder about the UK Forum. Lots of good info there. BTW, I looked for your article in Furniture and Cabinetmaking and didn't see it. Was it in the last issue or the current issue? Hey Gary, the photos in which there is one hand or no hands, I took. The ones with two hands were taken by my partner, who has recently stopped complaining about my apparent pickiness. Good thing, otherwise, I might have had to train the dog as you suggest. Ok, how do you take a picture of woodworking when there are no hands working the tools? Wow, you are sure one skilled craftsperson. I need at least one hand to hold a tool. It is indeed a steep and slippery slope . . . but oh such a fun to travel! I very much enjoyed this posting. Lots of good photos and references. I just completed a bench . . . and I am now in the process of planning a new bench of slightly different design. Hopefully I will find a good home for my "old" bench on Craigslist! Glad to see you are doing well. Gary, don't I at least get some points for that assist?! Hey, Kari-great post! I was wondering what your thoughts were on the New-Fangled workbench. Basically, to me,it looks like it performs similar operations to a normal bench-tail vise, side vise, etc. Since i live in an apartment, it would solve storage issues with my bar clamps; since i'm a beginner, it would let me postpone committing to a bench for lack of experience and skill (i can't see myself gluing up 250 lbs of beech in the foreseeable future), and as a student, it probably saves loads of cash. So-finally my question--what do you think of this bench, and what do you think the considerations of a beginner woodworker should be? Kari said - "Thanks for the ideas, Rob, and for the reminder about the UK Forum. Lots of good info there. BTW, I looked for your article in Furniture and Cabinetmaking and didn't see it. Was it in the last issue or the current issue?" Naomi, choosing a workbench is such a personal thing, like buying shoes, so I can only give you my subjective opinion. That being said, I can see where that style could come in handy for your needs and the planing beam is pretty slick. But the boards that pop out to reveal the pipe clamps would drive me nuts. First, you would have to make sure the boards' surfaces were perfectly coplanar with one another. Second, what happens when you need to handplane a board whose width is thinner than the well space? What supports it? Thirdly, you lose some beefiness with those removable boards. I prefer a benchtop that can take a pounding. Also, it seems like there is a longer set up time with both the pipe clamp face vise and end vise than with regular vises. I'm just not a fan of lots of variables and prefer a simple, flat surfaced bench. You don't have to glue up a ton of boards to make the benchtop. There are other options, like using a few sheets of mdf or plywood, as long as they are fully supported to prevent sagging. I made a utility bench with 2x4s and merely screwed each board to the supports and left a little wiggle room in between the boards to allow for expansion--no glue up. All in all, it almost seems like it would take you as long to build one of these than it would a regular workbench. I love discussions about workbenches. in many ways it’s like discussing politics and religion! What design to use? Traditional, but who's tradition? Scandinavian? Shaker? British? Or will it be of modern design? Or, will you copy your guru’s version? What material will you use? Hard Maple? Fir? MDF? It is for hand tools? Power tools? Sheet work? Prep for the lathe? Carving? Are you left or right handed, short, tall, long or short armed or with a disability? Will it be single purpose or used as clamping station and drafting table? Will it have storage or not? How about electrical plug-ins? Those useful but often cranky bench vises: Record-style with quick release or not, Emmert Patternmaker’s vise, make your own, or adapt pipe and G-clamps. Possibly the best advice I ever got was - build a bench that suits your style of woodworking because a general-use bench is often like the adage “master of none”. Two topics of which I never tire: workbenches and jigs. Bill's right, Naomi...you have to consider how your bench will be used and that will help determine the design. oh...that didn't sound quite right...um...it's good to see you're "working" again. Hi Kari, Great post, I use a large bench 4 x 8 MDF torsion box top, and I used lots of jigs for working with that bench. I do commercial cabinets and custom kitchens, I also have an old woodworking bench that I use for hand work. I would love to also build myself a new bench for hand tools, still working on my design. I love your blog and I always learn something from it. you and your readers may be interested in my buddy's blog. I also told him about yours. he is a master chairmaker and teacher. Joey, torsion box workbenches are great. I built a base for my assembly table that has been awaiting a work surface for 3 years and I've finally decided on a torsion box style top. I'm with you on having two different styles of workbenches — with one used for handtools. Richard, thanks for the link! I am actually familiar with Peter's site. He does outstanding work. IMO, chairs are the most difficult piece of furniture to build.